1. 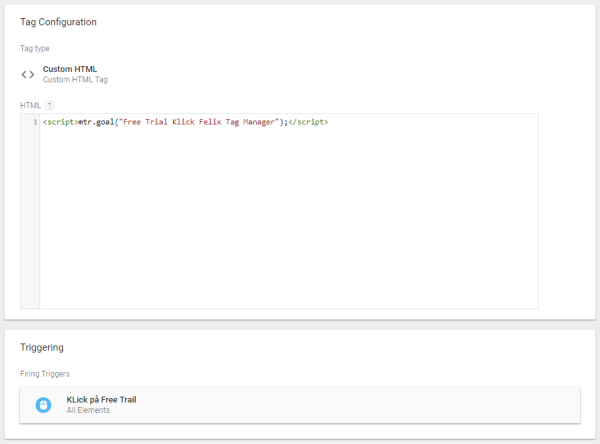 Login to Google Tag Manager. Start by navigating to "Variables" and click on "Configure". 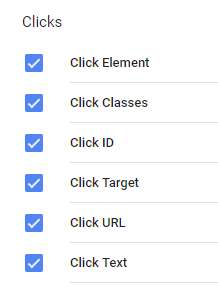 Check all the options under Click. Hit save. 2. Navigate to Triggers and click on "New". - Choose "All elements" under the headline Click. - Choose "Some clicks" in the radio buttons that appear. Then you have to find the CSS class name on your link or button on your website. IMPORTANT: Replace the text that says Your Goal Name Here - and make sure you use "quotes" on both sides of your text. The text you write is what the name of your goal will be. Each of these goals should be run separately in separate tags. Hit save, and you're done! Try clicking on the button you added your goal to and see if it pops up in the Triggerbee visitor feed. Keep in mind: It can take up to 10 minutes before your goal appears in the visitor list.